We can help you design a unique rug that perfectly suits your interior decor. Years of art and design experience allow us to create a masterpiece with a custom made area rug. 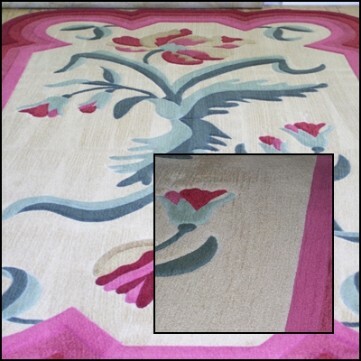 Any existing rug can be customized and its size altered, as can colors. We can custom cut and bind your carpet to fit almost any area. Measure the area you wish to cover and we will create and area rug just for you. Add a professional look to any entrance. Custom rugs and mats with your logo imprinted are a unique way to promote your company image. Hand-crafted rugs and carpets; edged with fringe, serge tape, leather, cotton, jute or polyester binding. Each piece is precision cut and handcrafted into a beautiful floor covering. Turn your room into a masterpiece with a custom made area rug! 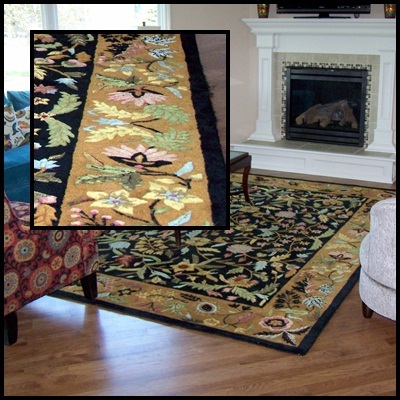 In most cases Jones Services can repair damage by re-tufting snagged yarns, trimming frayed areas, replacing fringe, cutting out damaged areas, patching, re-weaving, backing repair and re-binding, or re-serging decorative rugs. See our rug repair services here.